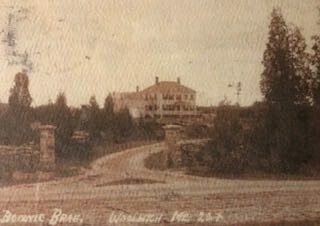 An old postcard of my home - When we owned it, the trees had grown up all around it, so it wasn't visible from the road. Today is Poetry Friday, and our hostess is Catherine at Reading to the Core. She's sharing a poem planned for the start of school....yipes! Already?? I missed last Friday's poetry, though I did write some. I read about "Where I'm From" poetry introduced by George Ella Lyon, and tried one. I also later found this form online: http://freeology.com/extras/whereimfrom2.html. It would be good for getting started with students. Though some have seen my original there version on FB, I have revisited and revised it. At one early point I had accidentally taken out the "lilacs" that I wanted in there, so they are back. Then my brother read it and mentioned "Brown Rim Cookies". No one else in the world that I knew ever made them, or had heard of them. So I've included the cookies in the poem and a recipe at the end. I became an expert at tucking the edges of the linen towel inside a glass, dipping it in water, and applying just the right amount of pressure to the ball of dough so that the edges wouldn't burn. There were a few "Burned Rim Cookies" before I got it right! Yesterday, the 26th, would have been my mother's birthday. So let's just say it is in honor of her. For she is really "where I'm from" in many, many ways - even to her choice of my hard-working dad, Alex! Mine didn't have a headlight, but it was probably used when I got it. My brother got a red bike the same day. of the Red Sox farm team. under the apple trees and old elm. Mom’s vegetable garden in the backyard. and pressing down brown rim cookies. hundreds of children teaching me. away from family and old friends. on a blue Schwinn I named Daisy. Combine shortening, salt and vanilla. Add sugar and cream well. Add eggs. Beat thoroughly. Add flour. Mix well. Drop by teaspoonfuls and flatten with water glass (damp cloth over bottom). Bake at 350 degrees for 8-10 minutes. Note: Mrs. Foye was an elderly woman who would sit on our porch and ask for specific apples from our trees. Mom was a registered nurse, and she and Dad opened our house up for a while to be a nursing home at Bonnie Brae. We had patients in 5 of our bedrooms, and we slept in the "summer" rooms over the barn and summer kitchen. I love this. I feel like I have just wandered through the backyard of your life. Thanks for such a sensory, rich experience, and hugs to you in this week of your mom's birth. Thanks, Sally. It was a busy childhood! Beautiful. I love where you and your mother are from. Thank you for sharing. It has been a wonderful trip to here from there. Lol! "Give it a shot!" My mom used to say that about trying anything new...and sometimes sarcastically when she knew better than I did! I could just hear her voice at the end there when I read your comment! There is so much to love here....barefoot and blueberries, a Schwin named Daisy, fences to mend....until the snow flies. All so descriptive. I remember summer was barefoot every day - on sharp rocks, hot sand, cool grass and stubbly new mown hay. In fall, it was hard to get your feet back into shoes - they enjoyed the freedom so much! Thanks for the recipe, something new to try, Donna! I love each part, have lines of where you're from the same for me, that floating boats & chokecherry hideaways, though mine were hydrangeas, I think. It's a lovely trip into your life and your mother's, too. 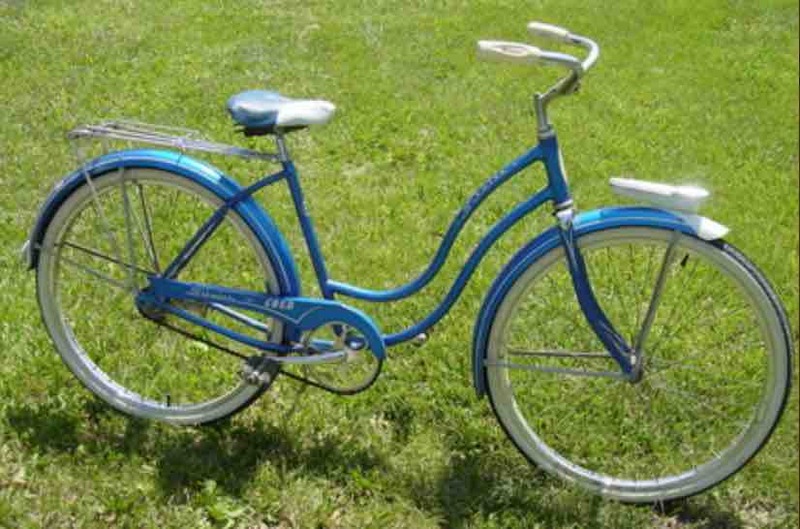 FYI - I had a blue Schwin too, don't think I could find a picture but I loved it a lot as I'm sure you did. I ALMOST put my hydrangea in! It was just in the corner of the raised area my mom gave me to grow nasturtiums, marigolds and zinnias in. 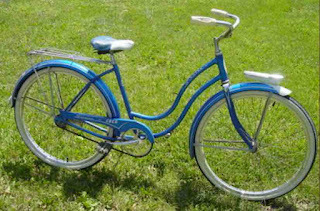 I should have known you had a blue Schwinn, too! Loved, loved that bike - my only way to have a horse back then. And it gave me so much freedom. You have a rich and wonderful life to draw from, Donna - it was such fun to linger at each line and visualize the experiences. There were so many other things I could have included. I may have to jot them down so that I have them written somewhere. Since my parents had a used furniture/antique store we would sometimes - no oftentimes come home to different furniture. "Surprise! Different bed! We sold yours." A foghorn -- wow! So many cool details like "real fences to mend." I enjoy reading these "where I'm from" poems a lot! Wish I had a photo of Mom blowing that horn to bring her herd home! These are as fun to read as they are to write! It gives us such a picture of your past...and you now! They do help bring up old memories. I think everyone should write one. I had so many more memories from both childhood and later, but they could make a book rather than a poem! I enjoyed this poem. I like the "I am from" repetition. I can see this as a good exercise for a classroom writing experience. Thanks for sharing. Donna, your poem is so rich and evocative, I can smell the lilacs and hear the swish of the jump rope. 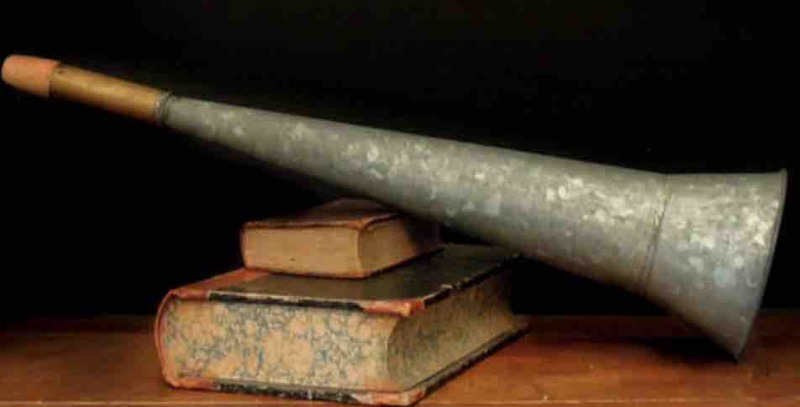 I had a an old cow bell that I rang to call my kids in from the woods. Thank you for sharing so many cherished memories! Your details are so evocative. I loved reading this from start to finish. I've started an "I am from" poem but have never finished it. Your poem nudges me to go back and revisit it. Thanks for sharing your childhood and memories with us!